Physically, painting in the studio differs from outdoor painting in only one respect—there is no time constraint on your efforts. 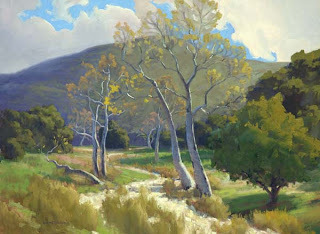 The actual process of studio painting is generally the same as outdoor painting, though often more refined. 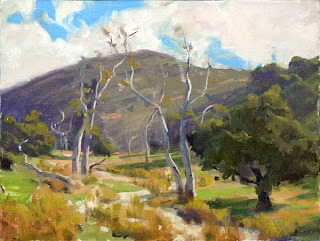 Limiting oneself to either studio or outdoor painting often causes your art, in general, to suffer. 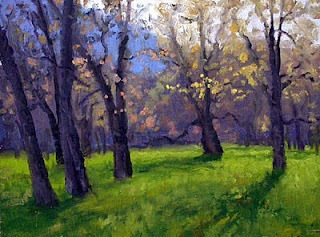 Outdoor painting carries freshness, a spontaneity, a truthfulness that can rarely be duplicated in the studio. Conversely, away from the sun, wind, insects, harsh elements and ever changing light, studio painting allows you to take your time and think deliberately through each stage of the process. Given no time constraints, studio painting enables you to complete large canvases. 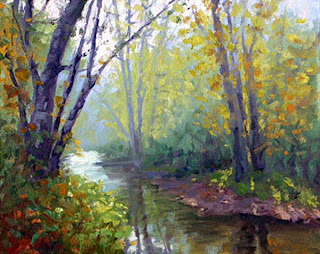 Organizational skills acquired in studio painting translates to painting outdoors, giving the artist more authority and confidence in the field. Studio painting requires good working habits, free from distractions. I never start a painting in the studio unless I know I can accomplish enough work to lock in the concept. I find the concept is the most critical stage of the painting. Getting to this point carries me through the rest of the process. The majority of my studio and outdoor paintings are finished in one sitting. The time-spent painting in studio may be double or triple the time it takes to paint a piece outdoors. My outdoor works are emotional responses to what I am experiencing. My studio paintings are a thoughtful refinement of those feelings into a powerful, emotional statement. One endeavor compliments the other. Both disciplines are stronger because of this knowledge. The following is a list of some concepts and techniques to consider when painting in the studio. These ideas provide a thoughtful and deliberate approach to the painting process. Painting in studio does not require more detail or finishing every inch of the canvas equally. Do not think of these ideas as a departure from the technique used painting outdoors. All of these concepts are interrelated and the overall emphasis you place on their individual use determines what we call style. These sketches can be outdoor paintings or can be completed in the studio from a combination of outdoor sketches and/or photographs. A black and white value sketch can be separate from a color study if it helps you to better understand the elements of your design. Sketches or studies are helpful for working out the uncertainties of a design. Although we try to be precise with our drawing when outdoors, concessions are often made in the spirit of expediency. A more accurate approach to drawing is possible in the studio when time is not so critical. This doesn’t mean tighter or more detailed drawing. Accurate drawing is attention to correct proportion and perspective. Good overall rhythm and balance are other considerations. Exaggeration and a stylized method of reproducing the essentials in a scene can be a useful tool in painting. These elements can provide a more powerful statement. To focus the center of interest, we sometimes use elongated or truncated forms or perhaps vary the size of an element in relation to the other parts of a painting. Nature rarely provides a scene that translates perfectly into a good painting—no matter how beautiful. When using exaggeration, one must be careful not to over embellish and end up with affectation and style over substance. Exaggeration is not a way of hiding inability or weakness in drawing. A deliberate and varied application of paint in thick and thin passages is aesthetically pleasing. Usually the darks are thinner, having been rubbed or laid in first. Thicker use of paint is generally limited to the lighter areas of the painting and the focal point of the design. Brush Calligraphy is a more conspicuous method of brush use involving small and large brush shapes and the direction of paint application. This method is most notable in the Bravura Painters such as Frans Hals, John Singer Sargent, Anders Zorn, Joaquin Sorolla and Dean Cornwell. 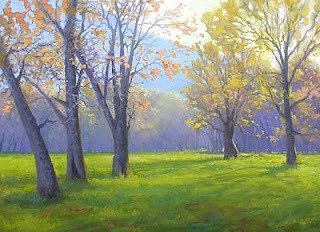 Keying your painting is a more thoughtful approach to color and value relationships in regards to the subject. Keying value can be thought of as confining the light and dark areas of the composition to a limited value range for a more unifying effect. Keying color is changing the color hues and color temperature of the scene for a more harmonious look than provided by nature. It can create a powerful mood that may not be representative of reality, but still reads as believable. Abstractions are the elements of the painting viewed as nonrepresentational shapes in relation to the pictorial plane. It is the organization, design and editing of these elements in the composition. It can include simplification of the scene or elements in the scene to emphasize the subject and the addition of elements not in the scene to lead the eye through the picture plane. Texture is a consideration of the textural properties of the subject being painted. Many artists ignore textural qualities to their detriment. These qualities accentuate the uniqueness of the objects and should not be overlooked when considering the overall design. 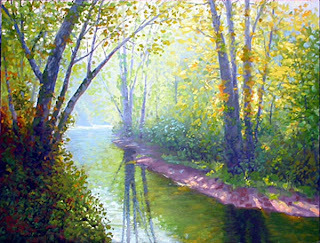 The roughness of bark or stone and the smooth properties of still water are elements to be used in the overall orchestration of the painting. Textural effects are another method to add interest to a subject in a painting without changing the compositional shapes. There’s a lot of great material here. You’ve really thought through the difference between the value of the on-the-spot work and the studio work: as you say, emotional reaction and refinement. I always find it strange how much I can get done with three hours on location, and how impossible it is to work that efficiently in the studio, even without distractions. I know what you mean about outdoor work. I think the big difference is the input to all five senses that we get from being there. There is no way to reproduce it indoors. In the studio it is only the visual input of the scene from our memories, sketches and photos.